..... Click the link for more information. ). He left his library of magic, one of the most complete and valuable in the world, to the Library of Congress. Among his many writings are The Unmasking of Robert-Houdin (1908), Miracle Mongers and Their Methods (1920), and A Magician among the Spirits (1924). Legendary escape artist Harry Houdini, c. 1900. Hulton Archive/Getty Images. Ehrich Weiss was born in Appleton, Wisconsin, on April 6, 1874. His father, a rabbi, was Dr. Mayer Samuel Weiss and his mother Cecilia Weiss. His parents had come to America from Hungary. One Internet web site suggests that Ehrich was actually born in Budapest and came to the United States with his parents when he was four years old, but the majority of references state that he was born in Wisconsin. He had four brothers—Theodore, Leopold, Nathan and William—and a sister, Carrie. From a very early age, Ehrich showed skill at conjuring and at picking locks; he once picked the lock to his mother’s pie cabinet in order to steal a piece of pie. When a circus came to town, he amazed the manager with rope tricks he had taught himself. The manager offered him a job and he did perform while the circus was in town, but his father forbade him from traveling with the show. By the time he was eleven, Ehrich could pick any lock, having worked—as one of many odd jobs—with a local locksmith. He dreamed of becoming a stage magician, avidly reading a book on the French conjurer and illusionist JeanEugene Robert-Houdin (1805–1871). With a friend named Jack Hayman, Ehrich worked up an act using some of the tricks and mind-reading codes from the Houdin book. The two boys called themselves the Houdini Brothers in honor of their inspiration. Later Hayman dropped out and Ehrich’s brother Theodore (later known as Hardeen) joined him. They performed at local clubs, dime museums, and side shows. While performing at a girls’ school in 1893, Ehrich—now calling himself Harry Houdini—accidentally spilled some acid on a girl’s dress. His mother made the girl a new dress and Houdini delivered it to her. The girl was Wilhelmina Beatrice (Bess) Rahner, a Roman Catholic, and she later became Houdini’s wife. She also later joined him in his act, assisting in mind-reading tricks. In an effort to make money when times were hard, Houdini and Bess resorted to holding fake séances, working with information obtained through local tipsters. Houdini was amazed at how easily the “mediumship” was accepted. By 1900, Houdini had perfected his lock-picking skills to the point that he could challenge any audience member to lock him up in their own handcuffs and he would get out of them. He made headlines escaping from a Chicago prison and also from handcuffs applied at England’s Scotland Yard. He dreamed up spectacular feats, such as escaping from straight-jackets, coffins, locked boxes submerged in water, and ropes suspended from high buildings. His name became synonymous with escapology. In 1920, a friendship between the Houdinis and the Doyles began, lasting four years. On a tour of England, Houdini and Bess met Sir Arthur Conan Doyle and his wife Jean. They became friends, corresponding regularly on the Houdini’s return to America. In 1922, it was the Doyle’s turn to cross the Atlantic and they met with Houdini and Beatrice in Atlantic City in June of that year. Lady Jean Doyle had developed her mediumship, being especially good at automatic writing, and offered to try to contact Houdini’s mother for him. Houdini had a very close bond with his mother and was devastated when she died. For years afterward, he visited variousmediums in the hopes of getting a message from her. When he did not, he blamed the medium. Certainly, many of them were fraudulent—but no match for the master conjurer. When Lady Doyle offered to try to make contact, Houdini accepted. Bess—using a code from one of their mind-reading acts—advised her husband that the previous evening she had given Lady Doyle a lot of information about his mother. Bess left the room and the séance began. Lady Doyle received a message that referred to Mrs. Weiss’s “darling boy” and described her happiness in the Summerland (the Spiritualist afterlife). She spoke a lot of her love for her son, and then asked God’s blessing before she left. 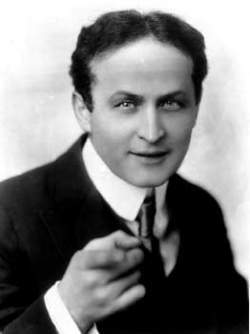 Six months later Houdini denounced the material produced, pointing out that his mother was Jewish and would not have drawn a cross at the start of the message. Also, she spoke little English and would not have been able to write so fluently. Sir Arthur explained that Lady Doyle always started her writings by drawing a cross, as a protective measure. Also, it is not uncommon for spirits to come through in the language most easily understood by the medium, regardless of the spirit’s actual original language. The two families disagreed and the friendship was broken, never to be mended. By 1924, there was open hostility between them. Matters came to a head when in January, 1923, when Scientific American magazine offered a prize of $2,500 to the first person who could produce a spirit photograph under test conditions and $2,500 to anyone who could produce physical paranormal phenomena and have it recorded by scientific instruments. The committee was made up of top psychical researchers, including William McDougall of Harvard, Daniel F. Comstock of the Massachusetts Institute of Technology, Malcolm Bird of Scientific American, Walter Franklin Pierce of the American Society for Psychical Research, psychic investigator Hereward Carrington, and Houdini. Mina Stinson Crandon, known professionally as Margery, was the medium to be tested for physical mediumship. The investigation started in November, 1923, while Houdini was out of the country, touring. He returned in July of the following year, furious that the others had not waited for him. Despite the glowing reports that the rest of the committee had given Margery, Houdini insisted on investigating himself. He claimed to have caught the medium in various little tricks, though could not actually prove that she was cheating. The press proclaimed that Margery had stumped Houdini. In August, he provided a box he had designed especially for the next séance. Margery had to sit in it and have a lid closed which effectively left only her head free. Margery’s spirit guide, Walter, accused Houdini of leaving articles in the box so that it would look as though the medium had put them there to aid her in deception. Many years later an assistant of Houdini’s admitted that he was responsible for putting the item (a folding ruler that could have been used for reaching out to move things) in the box at Houdini’s suggestion. Doyle and other Spiritualists attacked Houdini for his actions though, in fact, many Spiritualists had previously applauded Houdini for exposing the frauds. They did not, however, appreciate him making true mediums appear to be fraudulent. Although Houdini continued harassing mediums, exposing fraudulent ones, and claiming many secrets without actually revealing any, he was still anxious to find the one medium who would connect him with his mother. Looking toward his own eventual death, he and Bess worked out a code from their mind-reading act, to be used to tell her if he had made contact from the other world. The test was not far off. On October 22, 1926, in Montreal, Houdini—who boasted of the immense strength of his stomach muscles—was unexpectedly punched in the stomach by a student, backstage at a magic show he was giving. In extreme pain, he went on with the act and refused medical help. Nine days later Houdini died of peritonitis. A group of the Spiritualists from Ford’s church visited Bess Houdini and gave her the message. She had suffered a fall and was lying on a couch. She said, “It is right! My God! What else did he say?” Following the suggestions given by Houdini to Fletcher, a séance was arranged and the following day Ford went to Beatrice’s house. At that sitting Houdini came through and, after greeting his wife, repeated the words. In his autobiography Nothing So Strange (1958), Arthur Ford tries to put into perspective Houdini’s attacks on Spiritualists. In the early twenties Houdini turned his fabulous tenacity to exposing the whole Spiritualist movement. There were probably then about a million people in the country who called themselves Spiritualists. In these days when university research in the field of parapsychology has made psychic interests respectable, when extrasensory perception is seriously considered in psychology courses, when the physical scientists are far less dogmatic about the non-physical world than was formerly the case, it is difficult to recover the violent reaction of the orthodox against Spiritualism in Houdini’s day. In the orthodox mind all Spiritualists were equated with the lunatic fringe and all mediums were tools of the devil, even if there were no devil. Here Houdini took his stand with the orthodox and lined up his targets … There is no doubt that Houdini informed himself in the field of psychic phenomena, but always from the point of view of looking for the catch. When he read a report based on the testimony of top scientists, he merely averred that they were not as clever as he in seeing through a ruse. Very quickly after the breaking of the Houdini code, the mentalist Joseph Dunninger claimed that the code word had been given in a 1927 biography of Houdini. This seems unlikely, because Houdini and Beatrice had made such a point of using it to prove survival. But Dunninger did bring pressure to bear on the widow and she eventually issued a retraction of her statement. Bess kept a full-time publicist on her payroll for sixteen years after her husband’s death, just to keep the Houdini legend alive. (1874–1926) magician, escapologist; born in Budapest, Hungary. The son of a rabbi, he emigrated to Appleton, Wisconsin, and borrowed the name of a French magician. An established vaudeville star in England and America by 1900, he specialized in escaping from padlocked chains, cells, straitjackets, and underwater boxes. His escapes in public locales were covered in the international press and in 1910 he started a company to film his feats. Founder of the Society of American Magicians, he campaigned against mind readers and mediums who claimed to possess supernatural powers, but he encouraged attempts to contact him through a medium after his death.